Some "simple" projects can seem daunting, especially when it comes to glass. For some reason, nearly everyone is afraid of breaking glass, so they will either avoid working around it or go about doing things the hard way. Let's look at this side window assembly and see how to remove the glass in the most efficient manner. 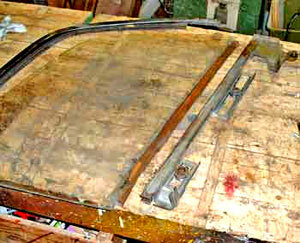 The original window, ready for disassembly. 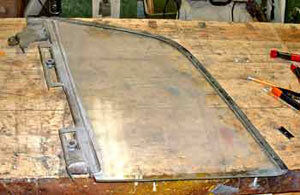 A typical car door window is held in place by the bottom track and a full - or partial - chrome-plated channel that frames it. The glass itself is sandwiched into these metal components with a rubber/fiber window channel material and some sort of sealing compound. In modern (post 1970)cars the sealing compound is probably a caulk-like material while in older cars the compound was a form of window putty. In either case the material solidifies over time and can be very hard to remove, so separating the window from the frame requires a little imagination. In all cases you will be able to separate the top part of the window frame from the bottom channel. In the case of this T-Bird window there are three screws at the back end that hold the chrome channel to the bottom frame. We had to drill out one of them, but suffice to say that you should be able to remove the screws in some relatively easy way. Just pry the channel away a little bit. You don't want to bend anything. In all probability the channel is going to stick to the glass, as it did on the subject window. We softened the old, dried putty in the channel by soaking the window in the laundry tub overnight. Soapy water did the trick and we were able to gently remove the chrome channel from the window without bending anything. Tip: When prying against glass always use a wooden spatula or wrap duct tape around screwdriver blades to prevent chipping! The fiber channel lining softened so much that it peeled away without scraping. The bottom of the window is also held in the channel with fiber lining and putty, but this T-Bird window had been sealed with more modern materials sometime in the past 20-30 years. Soaking did nothing to soften the grip on the window, so in cases like this we recommend inserting a thin blade between the glass and lining and cutting along its length to free the glass from the channel. You have to take time doing this. Cut as deeply as possible on each pass until you get to the bottom. 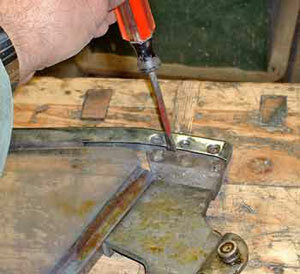 It is only when you can cut to the bottom on both sides of the glass that you can reliably pry the channel off. If you don't do this you stand a good chance of bending the channel or breaking the glass. 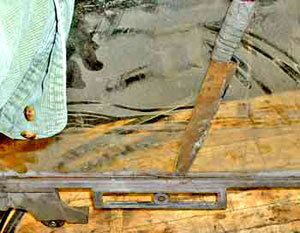 We used an old kitchen knife and sharpened the thin blade before cutting. 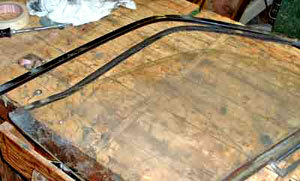 There it is, all ready for scraping, cleaning and reassembly of the window after repairs are made.